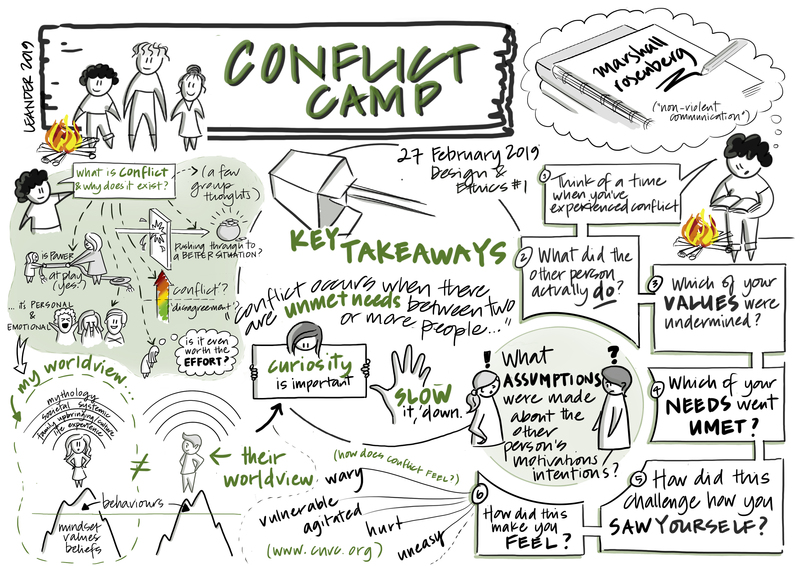 The first event for 2019 was Conflict Camp, a 2 hour workshop hosted by experienced facilitators Lina Patel (Facilitator and Collaboration Designer), Kate McEntee (PhD candidate in design at Monash University), Ryley Lawson (Design researcher at Paper Giant). Event sketchnote by Leander Kreltszheim (Mission Australia). Conflict Camp is based on principles of compassionate communication and productive collaboration, and dedicated to building participants’ conflict competence. Conflict is essential for healthy collaboration. It is important to develop ways to be with and navigate conflict in our work. This workshop was designed to be appropriate for people at all levels in their organization, whether they are building a new team, are an experienced people manager or are new to collaborative work environments. It was also designed for those seeking a more informed and mature practice around facilitation, communication and collaborative work. • develop strategies to consider how one might navigate and respond to conflict. This event was hosted at the offices of Paper Giant, a strategic design consultancy that helps organisations understand and solve complex problems.